The Ad Hoc Committee, 17,253 petitioners, 16 members of Congress, and one Assemblyman appealed to Keiro and Kamala D. Harris’ Office of the CA Attorney General to hold the public meetings that were denied us but Keiro and the AG have responded only with SILENCE. At this public meeting you will hear what you should have heard had Keiro been more transparent about this sale to Pacifica. 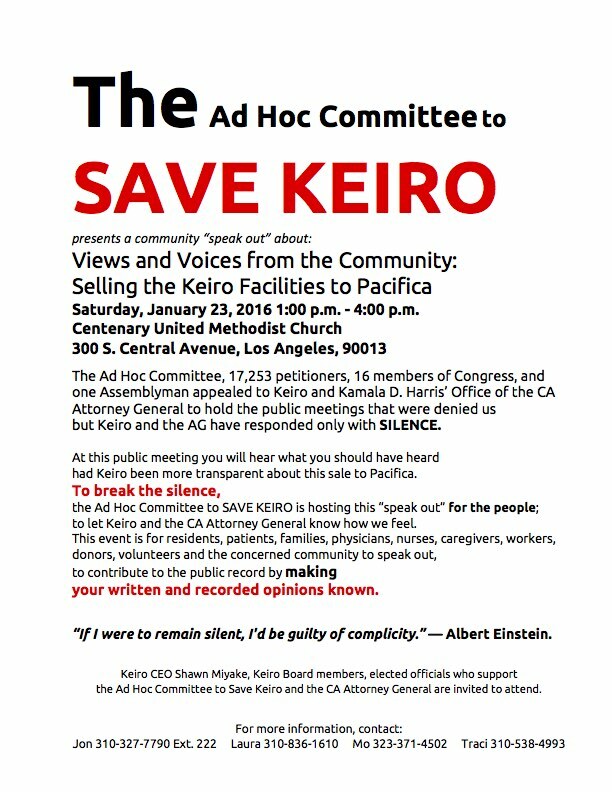 To break the silence, the Ad Hoc Committee to SAVE KEIRO is hosting this “speak out” for the people; to let Keiro and the CA Attorney General know how we feel. This event is for residents, patients, families, physicians, nurses, caregivers, workers, donors, volunteers and the concerned community to speak out, to contribute to the public record by making your written and recorded opinions known. “If I were to remain silent, I’d be guilty of complicity.” ― Albert Einstein. 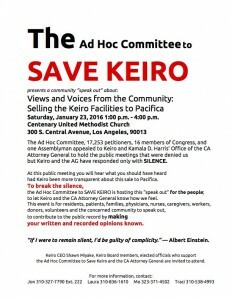 Keiro CEO Shawn Miyake, Keiro Board members, elected officials who support the Ad Hoc Committee to Save Keiro and the CA Attorney General are invited to attend.